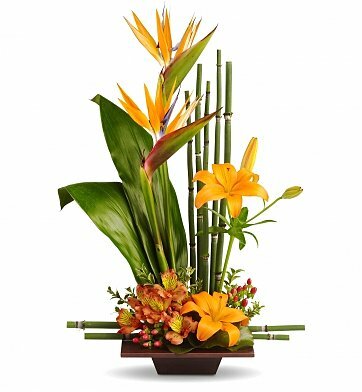 An elegant bamboo base gives rise to fresh flowers such as birds of paradise and Asiatic lilies. Dramatic accents add color and dimension while the addition of tropical leaves make the scene of paradise complete. Standard Arrangement Measures 16" x 25". Exotic Grace Arrangement is a hand delivered gift. These gifts are delivered by one of our local design centers located throughout the United States and Canada. Same day delivery is available for most gifts when ordered before the cutoff time. The cutoff time for Exotic Grace Arrangement is 2 PM in the recipient's time zone. The arrangement was beautiful and the delivery was very fast! Delivered within about 3 hours. Very pleased that it was done on the same day before the patient was discharged. My mom loved the Exotic Grace Arrangement!! The Exotic Grace Arrangement was so beautiful and very exotic!!! The flower arrangement arrived on time and was so beautiful! Not only would I recommend it to friends and family, but I would purchase it again. Thanks!!! Sent this arrangement to a dear friend in the hospital. She said that everyone who comes in the room is amazed by it. We will not be able to see it in person but she loves it. That is the best part. Can't believe how fast this was delivered and how beautiful the arrangement was presented! Just great. I ordered it online at 10am and it was delivered the same day. Looks fabulous and was a big hit with our staff. Thank so much. The upgrade from standard was excellent. Delivered as stated. Recipients over the moon. I had a very good experience with this vendor. I sent this arrangement , along with a balloon, to a friend for her 60th birthday and she was thrilled! She even texted me a picture. When one of the flowers in the arrangement was not available in time for delivery the next day, they called me immediately to suggest and discuss an alternative. The end product was stunning, and delivered on time. This was ordered for a house-warming gift. The recipients LOVED it. I would highly recommend it. It's still lovely and healthy after 10 days. Ordering flowers using the internet is not easy because you never know how the bouquet will really look. Well, my aunt was thrilled and amazed with her flowers. I was told that my uncle did not believe that they were real until he touched them. I would like to thank you for prompt delivery and an amazing product. The person who received this loved it, and many friends who saw it loved it. Thank you for a great product! This company does beautiful work and truly does deliver the same day. There were so many compliments on this flower arrangement. I sent it to my husband in the hospital. Thank you again for the timely delivery and beautiful flower arrangement. Simple from start to finish. Flowers arrived on time and were beautiful. This is a gorgeous arrangement. I sent it to my sister for her birthday because I knew she liked Birds of Paradise. The one she got varied slightly from the photo in detail but not in overall presentation (it had more lilies, some yellow carnations tucked in the bottom, neat little green berries, and artistic arches fashioned from some sort of plant life). All in all worth the cost. It is quite tall. Sent these flowers from Australia. Flowers were not quite the same as in the photo on-line but still quite pleasing. The recipient loved the arrangement. Thank you for making it so beautiful. Sent this arrangement to my daughter and she absolutely loved it! I highly recommend for that extra special person! In a state of high excitement! When the arrangement arrived, the team was speechless. Which is a good thing. They have not stopped talking about this arrangment. This made a very good impression and one that will last a long time. The couple who received it were amazed at the beauty of this arrangement. I sent these flowers to my sweetheart and was told that they were the most beautiful flowers she had ever received. She loved them and so did all of her coworkers! I would recommend this arrangement to anybody, they were absolutely stunning and beautiful! My sister sent me the picture and it looked exactly like the picture on your website. She said it was breathtaking and she was delighted with it. Thank you so much for exceeding my expectations again! You are my "go to" company for gifts now. I ordered this arrangement as a sympathy bouquet from my hula dance troupe when a troupe member's mother passed away. Everyone thought it was just perfect - thank you!